With so much fashion-related news having to digest every day, is no wonder my eyes were miles apart from what happens on the street. As usually during fashion weeks, somewhere around a zillion photographers get out there and capture the moment. I couldn't be more grateful. The sites are full of stylish people, and the streets abound in editors, stylists, models, critics, and, yes-sir, bloggers! 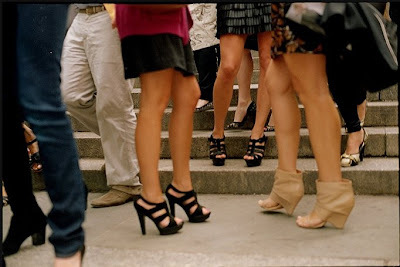 As Bill Cunningham from The New York Times cleverly notices, these days heels are all the rage. Nevermind the bag, it's the shoes who have to be sky-high. This here is a video with Cunningham talking about photos taken during The New York Fashion Week. Mostly, it's about women ending up having to change shoes. No matter how fabulous these are, how much elongated the line of the leg is, after a few hours, the feet will be aching and the beautiful shoes will have to be taken out. Here the comfy shoes jump in. Flats or flip-flops, you name it. Very eloquent photos with women changing their shoes in the middle of the street, mind-blowing stilettoes, fabulousity on heels. Make sure you check it out! Love these. Street fashion sites are so inspiring--I'm so happy real people dress like this!